This past Thursday with full moon blazing, I tested out some new gear under pristine skies. I recently decided to revisit autoguiding. I have a few criteria to meet: no laptop and ease of use. You see I am old and come from the film days of ST-4 and my all time favorite the STV/efinder combination. The SBIG SG-4 caught my eye since it requires no laptop in the field. One is necessary for initial focus on your guidescope, but as long as nothing changes with the scope/guider, just a click of the button and it guides away. AP130EDTGF on APMACH1 mount with guidescope and SG-4 attached. The guidescope selected is the Baader/AP guide rings combination for it’s promoted rigidity. The additional ring support on the focused tube is why I went with the Baader/AP guidescope. After initial setup of the SG-4 and focus achieved, I decided to also setup my Canon for first run with the Astronomic 12nm h-alpha filter. the goal was to begin collecting data on eastern veil. Here is the final part of the SG-4 calibration log. 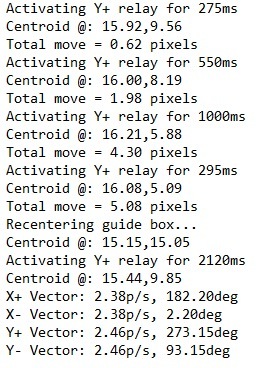 The most important part is the X+, X-, Y+, andY- movement in pixels and direction. With the SG-4 calibrated and the Canon focused with the h-alpha filter, we are ready for a test run. Here is a raw image at nearly 100% of the eastern veil nebula. It is a 15 minute auto guided frame. I did a simple polar scope alignment to begin the evening. I am very happy with the SG-4 in the backyard-the real test will come from a dark sky site. 100% crop of h-alpha eastern veil at ISO 1600 for 15 minutes with the SG-4/Baader/AP scope.